1st picture is A91 2nd is A91-M A-91 Russian Bullpup Assault Rifle Prototype in 7,62x39mm caliber,as made in mid-1990. Note unusual position of the integral 40mm grenade launcher, which is mounted above the barrel. Caliber: 7.62x39mm and 5.56x45mm NATO Action: Gas operated, rotating bolt Overall length: 660 mm Barrel length: ?? Weight: 3.97 kg empty (with integral grenade launcher) Rate of fire: 600-800 rounds per minute Magazine capacity: 30 rounds The A-91 bullpup assault rifle (also known as A-91M) was developed during the 1990s by KBP (Instrument Design Bureau) in Tula, as an offspring of the A-91 family of compact assault rifles described above in the 9A-91 article. While the A-91 retains the basic gas-operated, rotating bolt action and a trigger unit design from 9A-91, it features a bullpup polymer housing, with an integral 40 mm single-shot grenade launcher mounted under the barrel. 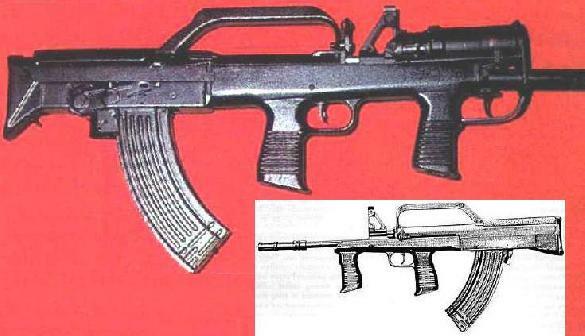 The earliest prototypes of the A-91 bullpup were fitted with the grenade launcher above the barrel, and with a front vertical foregrip; current models are fitted with the underbarrel launcher, which also serves as a forearm. The A-91 features a forward ejection system, initially developed in Tula by designers like Afanasiev during the early 1960s. In this system, the ejection port is located above the pistol grip, and points forward. Extracted cases are fed from bolt head through the short ejection tube to the ejection port, and fall out of the gun well clear of the shooter's face, even when firing from the left shoulder. As for now, the A-91 is made in small number and, probably, is used by some elite law enforcement units in Russia; it is also offered for export and domestic military and police sales. The controls include double triggers (front for grenade launcher, back for rifle), and a large fire mode / safety lever at the right side of the receiver, above the magazine housing. The rifle trigger is fitted with an additional automatic trigger safety. The charging handle is located above the receiver, under the carrying handle, and is easily accessible for either hand. The sights include a front post, mounted on a high base, and an aperture rear, adjustable for range, which is mounted on the integral carrying handle. The top of the carrying handle is shaped as a Weaver-type rail, and can accept a vide variety of scopes and sights. Folding grenade launcher sights are mounted at the front of the barrel. Originally developed for 7.62 x 39 ammunition and standard AK-pattern magazines, the A-91 bullpup is now also available in 5.56 x 45 NATO chambering, which uses proprietary 30 round polymer magazines.